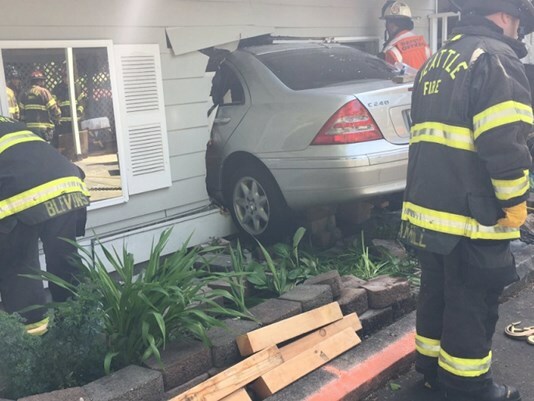 On Tuesday morning, a 2004 Mercedes sedan slammed into the front of a house in Lake City. The building was in use as an adult care facility. A 72-year-old woman who had been sitting inside the house was pinned under the car. Emergency responders removed her from under the car and attempted to revive her, but she passed away from her injuries shortly afterward. Firefighters who responded to the scene worried that the damaged house might collapse. Rescue efforts were stalled by a need to stabilize the structure before pulling the car out of it. Five residents lived at the Eden's Villa senior living community; they are now housed at a nearby care facility. Neighbors said that the owner of the facility also lived upstairs in the house, and told reporters that she was known for taking good care of the residents. Investigators found that the Mercedes that slammed into the building was driven by an 88-year-old woman named Elaine Babb. Babb did not show any signs of drug or alcohol impairment. She told reporters that she had been on her way to pick up one of the residents of the adult care facility; that resident was standing outside at the time and witnessed the accident. Babb was planning to take her to the Wallingford Senior Center. According to Babb, she “didn’t mean to hurt anybody;” she intended to back up her vehicle, and she didn’t know why it unexpectedly shot forward into the house. She told reporters that she plans to continue driving. At Davis Law Group, we have spoken to dozens of victims of vehicle-into-building crashes and crashes involving elderly drivers. Every day in the United States, researchers estimate that there are approximately 60 crashes involving a vehicle crashing into a business. 41% of those crashes are caused by a confused driver. In most of those cases, that confused driver mistakes the accelerator for the brake, causing the car to accelerate rapidly through the building when they intended to stop. According to the Center for Disease Control, there are more than 40 million licensed drivers over the age of 65 in America. Involvement in fatal crashes per miles travelled begins to rise in 70 to 74-year-old age range and peaks among drivers ages 85 and older. Drivers ages 85 and older account for more fatal crashes than any other age group, including teenagers. Age-related declines in cognitive function, motor function, and vision are risk factors for fatal accidents involving elderly drivers. In 2011, Attorney Christopher Davis spoke with Ken Schram on KOMO News Radio about Washington state’s laws regarding elderly drivers. Under Washington state law, there is no age at which a driver’s license can be taken away. Any driver who can pass the mandated vision test and medical examination can renew their license. In some cases involving severe vision or motor skills impairments, drivers are allowed to maintain a restricted license that may allow them to drive only during the daylight hours, outside of rush hour, or with the aid of mechanical or vision-enhancing devices. As part of a medical examination, drivers are asked about their history of blackouts, seizures, and loss of consciousness. However, examiners at the Department of Motor Vehicles do not have access to a driver’s medical records and are not trained to evaluate drivers for symptoms of dementia and other age-related diseases that can impair a driver’s judgement. Concerned citizens can report a dangerous driver to the Washington state Department of Motor Vehicles using the Recommendation for Driver Re-examination form. This re-examination process will allow Department of Licensing officials to consider at the driver’s past record on the road as well as their physical and mental condition.